According to the National Oceanic and Atmospheric Administrations (NOAA) National Weather Service, in the United States, the annual damage due to floods cost the nation USD 5 billion annually, while losses due to droughts average USD 10 billion per year. In addition, the countrys freshwater supply is critically stressed by a growing population, especially in environmentally sensitive areas along the coasts. The inconsistent availability of water along with the increasing demand is driving many government jurisdictions to regulate and monitor this critical resource. One way to meet these requirements is to gather and analyze water quality and quantity data as it travels from source to consumer and back. Water monitoring data is not only used for operational decision making and historical recordkeeping, but also to evaluate the effect of measures implemented to improve water resource management. This article looks at six stages of the water process and the opportunities for monitoring to improve delivery, regulation and emergency response. Frank McKenna became the President of International Launch Services (ILS) and board member in October of 2006, following two years as Vice President and Deputy of ILS. Additionally, in August of 2008, McKenna became the co-chairman of the Board of Directors of ILS. McKenna has more than three decades of experience in the aerospace and space launch businesses with Martin Marietta and Lockheed Martin Corporation, which was a partner in ILS until October of 2006. McKennas background includes business management, business development and strategy, several CFO positions, and management of domestic and international joint ventures. During the first year of McKennas leadership, ILS won more than $1.2 billion in new orders serving customers across the globe. In August of 2007, the industry publication Space News honored McKenna as one of 10 Who Made a Difference in Space. After establishing a significant quality initiative, by August of 2008, ILS backlog reached 24 Proton launches valued at more than $2 billion  a record high. In March of 2009, ILS celebrated a significant milestone  the 50th ILS Proton launch. In October of 2010, ILS and Khrunichev set the industry standard with 26 consecutive successful launches in 27 months  18 commercial missions and nine Federal missions. ILS, a U.S. company with headquarters in Reston, Viginia, near Washington D.C., is a global provider of commercial launch services for satellite operators worldwide, and offers a complete array of services and support from contract signing through mission management and on-orbit delivery. The Company has exclusive rights to market the Proton and Angara vehicles, and has launched most commercial satellite platforms. ILS has worked with all major global satellite operators. Khrunichev State Research and Production Space Center, which holds the majority interest in ILS, is one of the cornerstones of the Russian space industry and manufactures the Proton system and is currently developing the next generation Angara launch system. 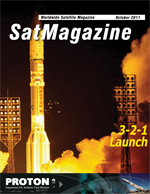 The Proton launches from facilities at the Baikonur Cosmodrome in Kazakhstan and has a history of more than 360 missions since 1965. Stuart C. Daughtridge is Vice President of Advanced Technology and Business Development for Integral Systems, a Kratos Company. Daughtridge joined Integral Systems in 1999 and has been instrumental in developing the Companys full line of satellite communications products and services. Before joining Integral Systems, he held several management positions in the spacecraft engineering and satellite operations division of Orion Satellite Corporation (acquired by Loral Space & Communications), including Director of Satellite Operations. Prior to Orion, Daughtridge was a spacecraft engineer at Intelsat, and Contel Spacecom. He holds a Bachelor of Science degree in Electrical Engineering from Lafayette College. We are at a tipping point in the satellite industry. The Cisco Internet Routing in Space (IRIS) initiative extends into space the same Internet Protocol-based (IP) technology used to build the World Wide Web. The long-term goal is to route voice, data and video traffic between satellites over a single IP network in ways that are more efficient, flexible and cost-effective than are possible over todays fragmented satellite communications networks. Thirty years ago, the state of the global teleport industry looked like this: Every teleport was owned and operated by either a government or large monopoly, providing basic telephony, video and data landing point services that linked major carriers from one continent to another. Profit margins were high and prices held steady, at easy-to-maintain levels. IBC is always full of surprises, and while visitors will always head for their favourite Halls to seek out the latest re-invention of this or that piece of kit, for me the two overwhelmingly fascinating exhibits concerned screens, and both represent good news for satellite broadcasters. On the one hand there was NHKs milestone screen in the shape of a Sharp 85-inch prototype LCD designed to handle 8K transmissions of its spectacular Super Hi-Vision/Ultra HDTV technology. Sea Launch is no stranger to bold ideas. Our concept of designing, building and owning our range and launching commercial spacecraft from a platform at the equator with minimal launch personnel is unique in the industry. The first launch of the Zenit-3SL in 1999 marked the culmination of four years of intense planning and development, performed by thousands of talented professionals around the globe through an international partnership comprised of RSC Energia, Yuzhnoye SDO/PO Yuzhmash, Boeing Commercial Space Company, and the Anglo-Norwegian Kvaerner Group. In that one successful launch, we broke the barriers of skepticism. We proved the concept worked  and worked well. In response to the threat posed by USSR long range missiles, in 1954 the U.S. Air Force initiated the development of a tactical ballistic missile. This missile would be capable of delivering a nuclear warhead over a distance between 1,850 and 3,700 km, a range that would allow Moscow to be attacked from a launch site in the United Kingdom. It takes more than rocket science to launch a rocket  and I should know. I work for SpaceX, a company that is revolutionizing rocket and space technology in order to take space exploration to the next level. SpaceX designs, manufactures, and launches rockets and spacecraft. Last year we became the first private company in history ever to launch and recover a spacecraft from orbit. That successful mission took place in December when we launched our Dragon spacecraft from Cape Canaveral and recovered it from the Pacific Ocean after a few hours in orbit. The consolidation of satellite uplink and antenna facilities as well as cable and DTH head-ends continues to be an industry trend, driven both by growth in channels and the opportunities to reduce overhead at 24/7 facilities. With this comes the need for robust, reliable and ever-higher capacity solutions for signal transport, switching, distribution and monitoring within the RF plant. This article looks at an example of how the operator of one of the worlds largest and most advanced satellite broadcasting centers was able to expand its facilities and connect two sites by fiber optics, to improve reliability for its L-band transmissions. TV distribution over satellite to date has been primarily a linear, one-way service. As with traditional broadcasting over terrestrial networks, the linear model was enough to keep viewers satisfied  until there was an alternative. Now that viewers have shown such a strong preference for interactivity in their media consumption habits, the writing is on the wall for providers of linear services.